The S-70 family was developed to meet a US Army requirement to replace the UH-1 Iroquois family of utility medium-lift helicopters in 1972. Program - Utility Tactical Transport Aircraft System (UTTAS). Three YUH-60A prototypes (+ two for ground trials) were constructed, with the first flying in October 17, 1974. They were evaluated against the Boeing-Vertol YUH-61A. Competitive machine YUH-61 approximately flown on November 29, 1974. In the spring of 1976, the army began testing flights. The result of the competition was announced on December 23, 1976. 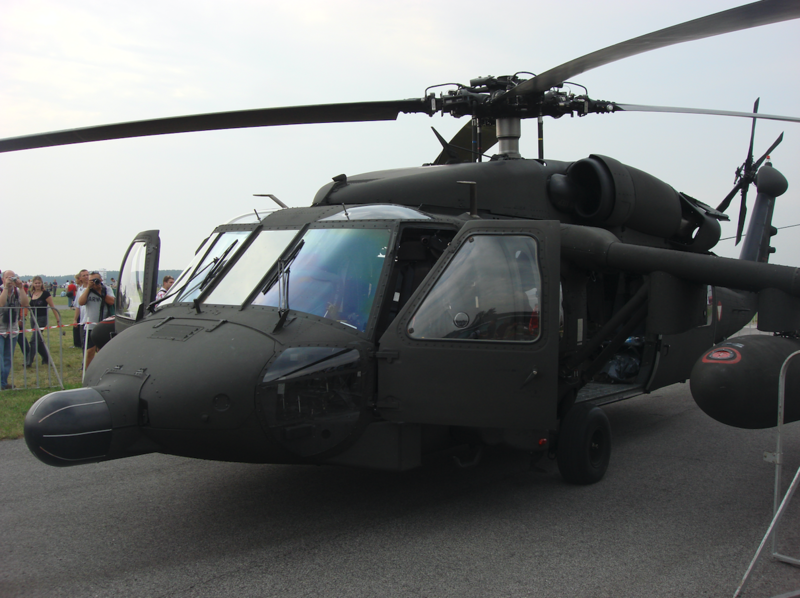 The YUH-60A was selected for production, and entered service as the UH-60A Black Hawk with the US Army in 1979. The first flight of serial UH-60 took place on October 17, 1978. The first military operation for UH-60 was the American intervention in Grenada in 1983. The UH-60 turned out to be very good. 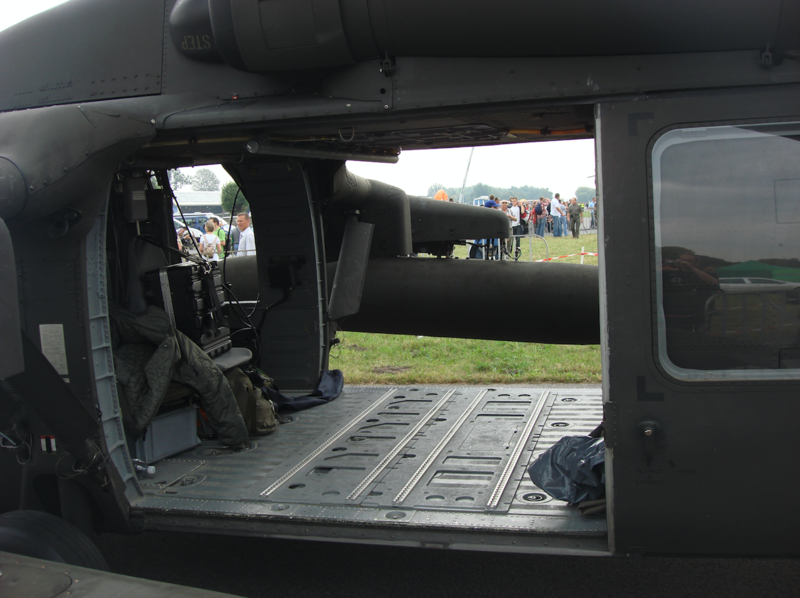 One of the UH-60 returned to the base with many bullet holes. After entering service, the helicopter was modified for new missions and roles, including mine laying and medical evacuation. An EH-60 variant was developed to conduct electronic warfare and special operations aviation developed the MH-60 variant to support its missions. In the late 1980s the model was upgraded to the UH-60L, which featured more power and lift with the upgrade to the -701C model of the GE T700 engine. The improved UH-60M model was developed in the early 2000s. The UH-60M and its International version, the S-70i, include GPS navigation, a glass cockpit, an integrated Flight Management System, and a significant upgrade to the powertrain and rotor system adding both power and lift capability. Several versions the S-70 are used to transport the President of the United States, which while carrying the President is known as "Marine One". In air assault operations it can move 20 persons, a squad of 11 combat troops and equipment or carry the 105 mm M102 howitzer, thirty rounds of ammunition, and a six-man crew. Alternatively, it can carry 2,600 lb (1,200 kg) of cargo or sling load 9,000 lb (4,100 kg) of cargo. The United States Navy received the first navalized SH-60 B Seahawk in 1983, and the SH-60 F Ocean Hawk in 1988. The United States Coast Guard received the HH-60J Jayhawk in 1992. The S-70A Firehawk is a version of the S-70 designed for firefighting, rescue, medical evacuation, and external lift of bulky cargo and equipment. The Oregon National Guard was the first military organization in the world to add the Firehawk to its inventory. The Los Angeles County Fire Department was the first municipal organization. The American film "Helicopter in Fire," directed by Ridley Scott, presents the real events of the operation in Mogadishu. During the action of the American forces, two MH-60 Black Hawk helicopters were shot down. The film was made in 2001 and presents the events of 1993. The S-70i helicopter can be configured according to customer specific missions, including troop transport and air assault, command and control, border patrol, search and rescue, cargo lift and VIP transport. In PZL Mielec, the first cabin was built on March 12, 2009. The first complete helicopter S-70i in PZL Mielec was built on March 15, 2010, and its first flight was made at the Sikorsky Aircraft research center in West Palm Beach, Florida on July 1, 2010. 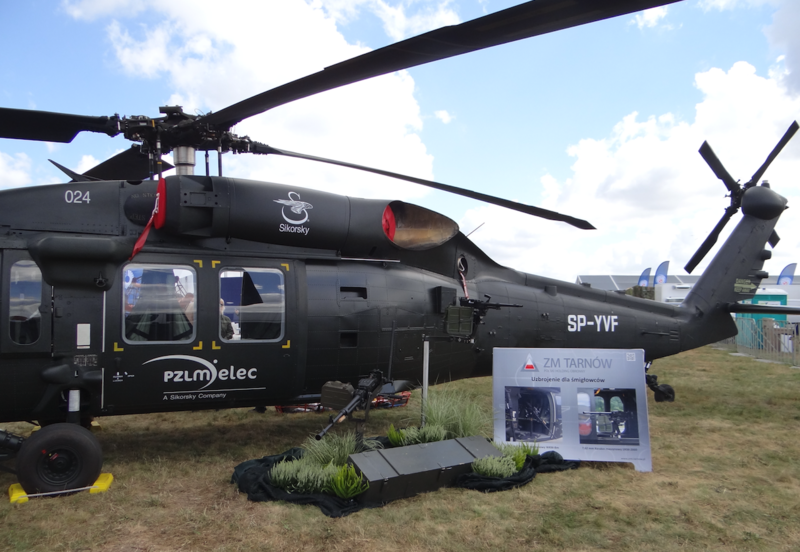 The S-70i and UH-60 helicopters have the same airframe, therefore the UH-60 helicopter element is produced in PZL Mielec. Initially, the S-70i helicopters went to the USA for retrofitting. 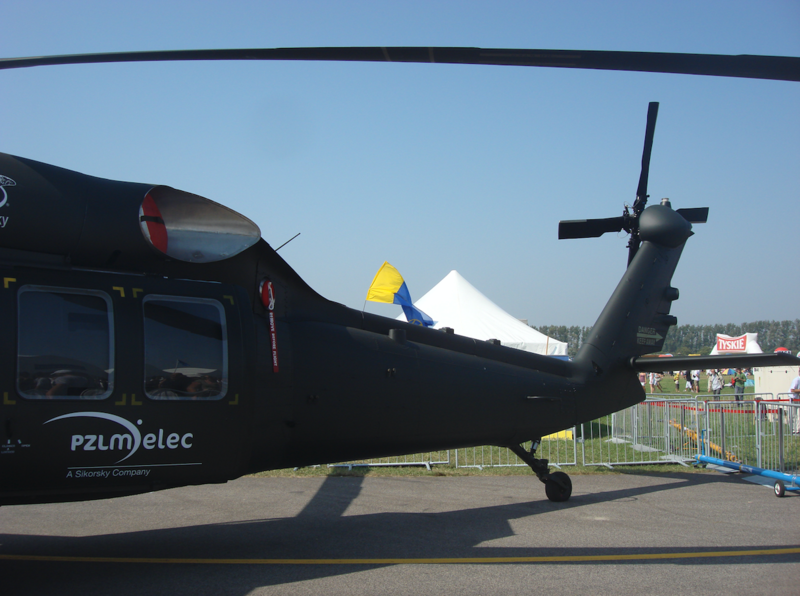 Then, the completion of helicopters was carried out at PZL Mielec and from Mielec they were delivered to clients. 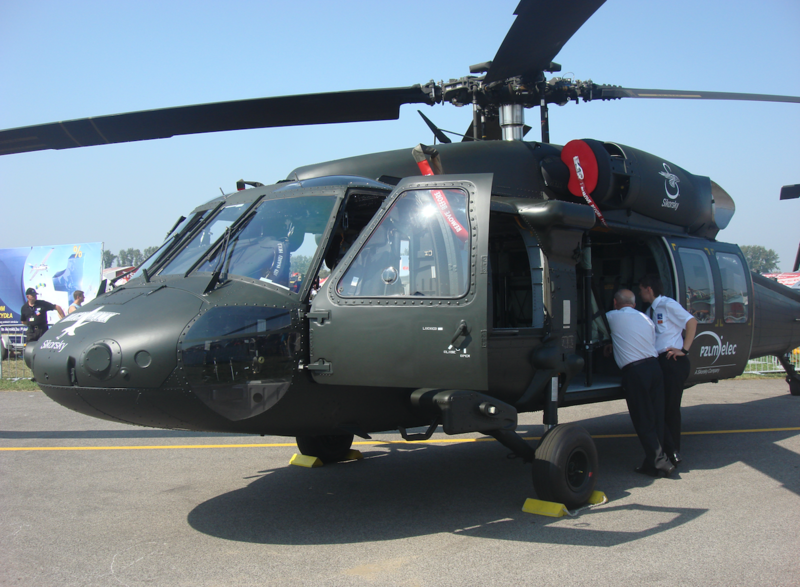 PZL Mielec delivered the first three S-70i Black Hawk helicopters to customer in August 2011. Sikorsky Aircraft signed a contract with the Brunei Ministry of Defence in December 2011, to supply 12 S-70i helicopters for the Royal Brunei Air Force (RBAF). The contractual scope also includes the supply of spare parts, training and ground support equipment, plus an option for ten additional helicopters. Sikorsky delivered five S-70i Black Hawks to the Special Forces unit of the Colombian Army’s Air Assault Division in March 2013. 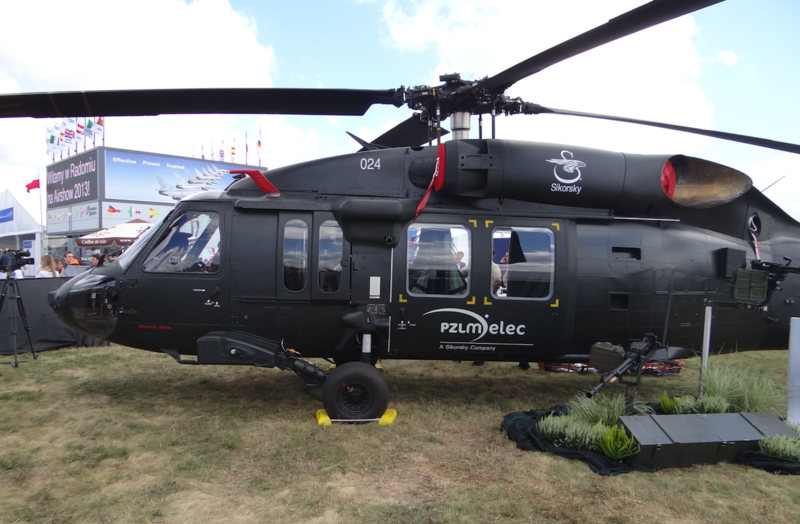 The Colombian Army placed an order with Sikorsky Aircraft for two additional S-70i Black Hawk helicopters in April 2013. 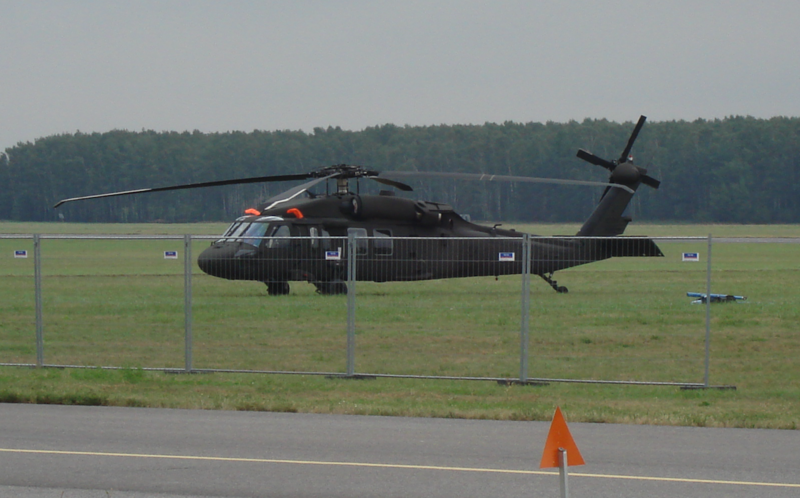 The S-70i Black Hawk helicopter has a maximum gross weight of 9,979kg. It can carry two crew members and up to 13 troops. The reliable crash-worthy airframe design of the S-70i integrates a machined cabin structure and a single-piece cockpit assembly. The structure can resist small-arms fire and high-explosive projectiles. Entry and exit of the crew and troops are provided by two jettisonable cockpit doors and two sliding cargo doors respectively. The helicopter can be fitted with ballistic protection, an active vibration control system, medical equipment, Integrated Vehicle Health Management (IVHM) system, auxiliary fuel tanks, an external rescue hoist, rappelling equipment and cargo hook. The spacious cabin offers an area of 8.1m². The S-70i Black Hawk is powered by two T700-GE701D turboshaft engines equipped with C controls. Each engine develops a maximum power of 1,447kW. The turbine engines can run for 30 minutes without lubrication. The T700-GE-701D engine is replaced in 4 hours. The helicopter has an auxiliary power unit APU Solar T62T-40-1 with 100 HP (75 kW). The twin-engine power plant drives the main rotor comprising of four composite-titanium blades. The fuel system is composed of two crash-worthy and self-sealing fuel tanks. The single-point service connection allows close circuit and pressure refuelling. 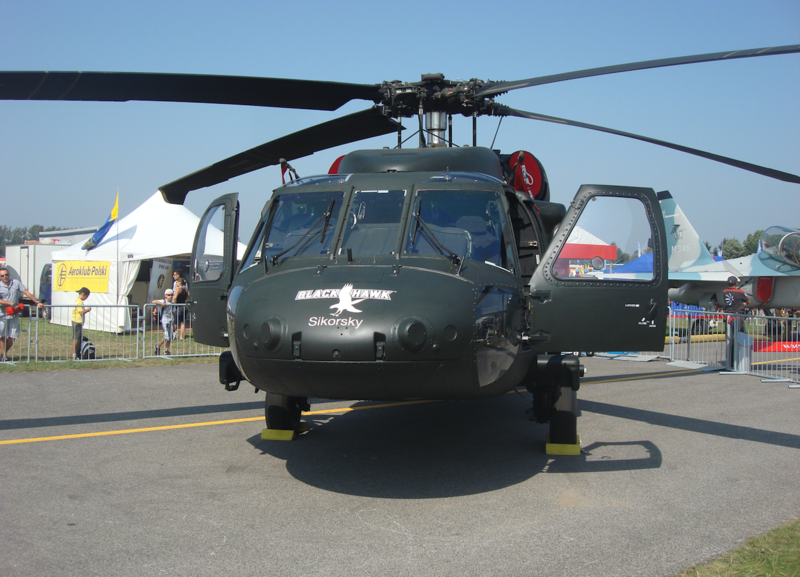 The S-70i Black Hawk features a three-point landing gear with energy absorbing features. The rugged landing gear allows the landing and take-off from virtually any unprepared terrain. The S-70i can fly at a maximum cruise speed of 277 km/h. The AEO (All Engines Operating) service ceiling of the helicopter is 13,200ft. The helicopter has a maximum range of 459 km with no reserve. The S-70i Black Hawk can be transported on the Lockheed C-130 Hercules aircraft. JUH-60 A - 1974 - At least 7 airframes converted for evaluation and several testing purposes. Another 20 or more as GUH-60A for ground instruction. 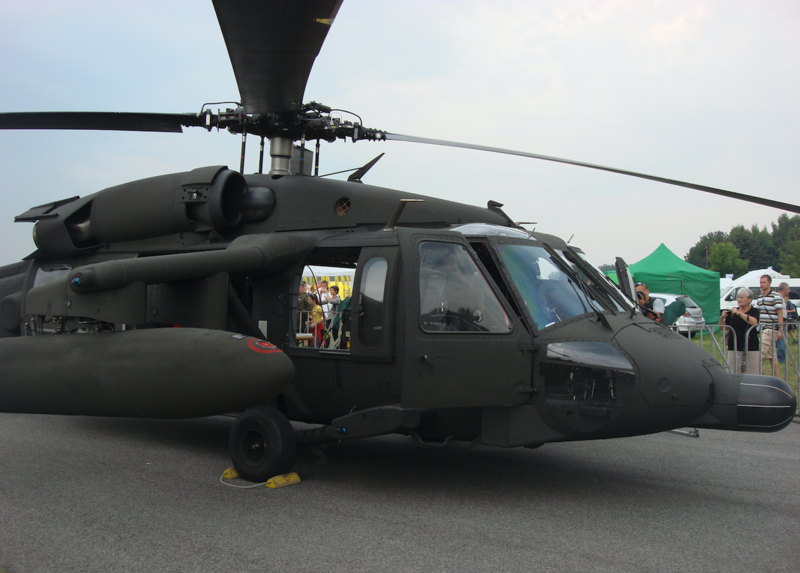 UH-60 A Black Hawk - 1977 - First generation Black Hawk for the US Army. Produced 1977-1989. Certificate for commercial use in 2015. SH-60 B Sea Hawk -1979 - The Sikorsky S-70B-1 is the US Navy LAMPS (Light Airborne Multipurpose System) Mk3 platform and is deployed aboard frigates and destroyers. EH-60 A Quick Fix -1981 - US Army UH-60A modified for electronic warfare (EW) intended to locate, classify and disrupt enemy signals traffic. MH-60 G Pave Hawk - 1982 - Special operations variant for the US Air Force. Redesignated HH-60G. S-70 B - 1984 - The B is the foreign export version for naval duties based on the Seahawk Customized variants included: Spain, Australia, Greece, Turkey. S-70 C - 1986 - Export version. HH-60 G Pave Hawk -1987 - USAF variant. The Pave Hawk differs from the Army Black Hawk in its auxiliary fuel tanks, aerial refueling probe and forward-looking infrared. S-70 A - 1987 - Export version. SH-60 F Ocean Hawk - 1987 - The Sikorsky S-70B-4 was the carrier-borne anti-submarine warfare (ASW) variant of the Seahawk developed for the US Navy. HH-60 H Rescue Hawk - 1988 - The Sikorsky S-70B-5 was developed in conjunction with the US Coast Guard HH-60J. Rescue Hawk main roles are combat search and rescue (CSAR). MH-60 L Black Hawk - 1988 - US Army special operations variant of the UH-60L produced as an interim version pending fielding of the ad-hoc MH-60K. UH-60 L Black hawk - 1989 - Second generation Blackhawk for the US Army. 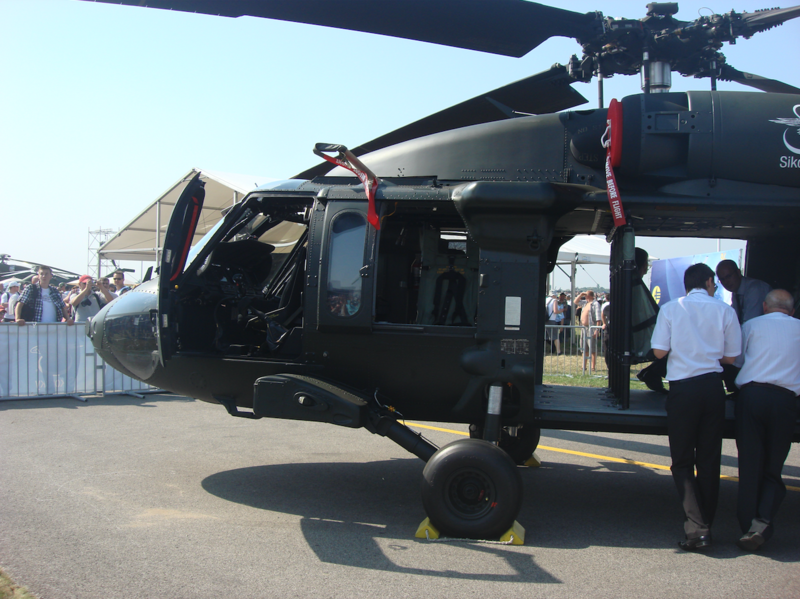 To be upgraded as UH-60V. VH-60 N White Hawk - 1989 rok - Flown by USMC HMX-1 and supports the executive transport mission for the president of the United States. HH-60J Jayhawk - 1992 - Sikorsky S-70B-5 / HH-60J for the United States Coast Guard. S-92 - 1998 - The S-92 is a twin-engine medium-lift helicopter for the civil and military helicopter market developed from the S-70 Black Hawk. S-70 Firehawk - 1999 - Firefighting variant equipped with a 1,000-gallon tank to carry water and fire suppressant. 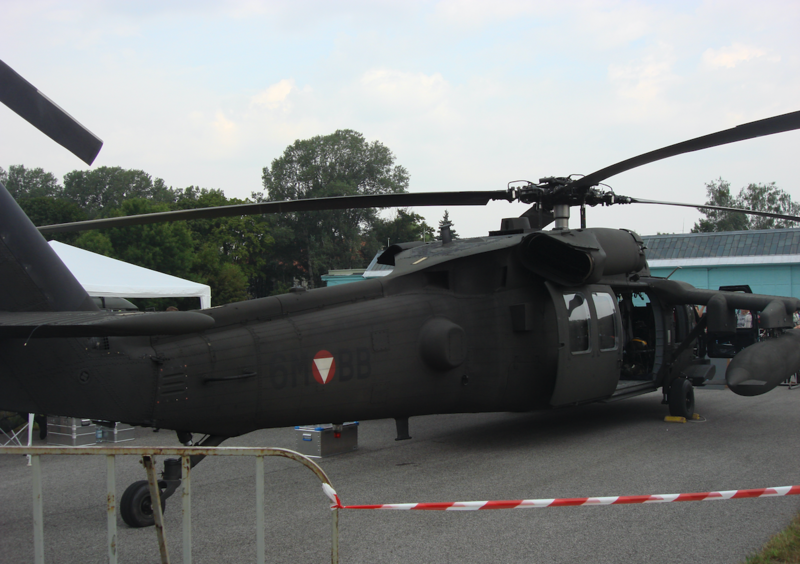 S-70i Black Hawk - 2010 - The S-70i is being produced for the international market at Sikorsky’s PZL Mielec facility in Poland. 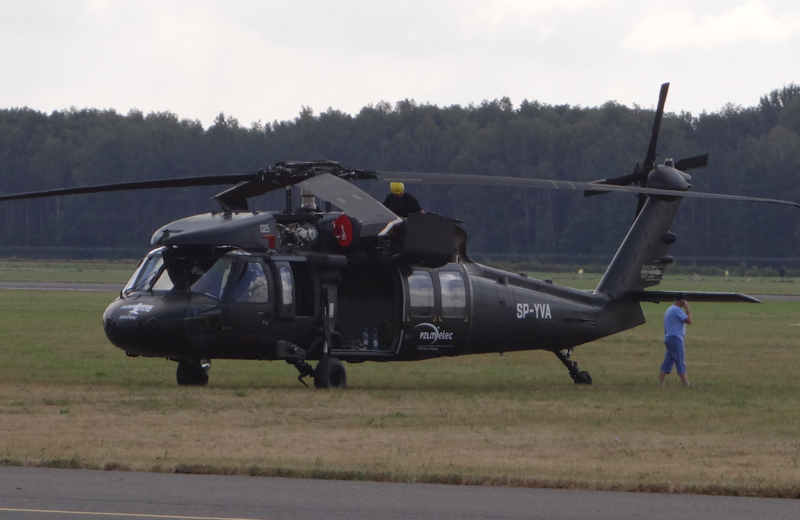 S70i Black Hawk - 2016 - Armed version produced at the Sikorsky plant PZL Mielec in Poland.